In 1960, Bill Coperthwaite bought 300 acres of forest wilderness in Machiasport, Maine. 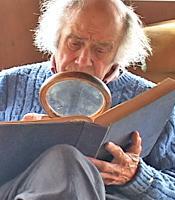 Influenced by the poetry of Emily Dickinson and by the back-to-the-land movement of Scott and Helen Nearing, he was committed to crafting what he called “a handmade life.” For more than 50 years until his death in 2013, Bill Coperthwaite lived and worked in the forest. He was a builder of yurts, and a maker of spoons, bowls, and chairs. An eloquent and thought-provoking meditation on time and process, this “intense, revelatory” four-part series presents an unforgettable portrait of a remarkable life – one shaped by nature, work, poetry, and the rhythm of changing seasons. Coperthwaite emerges as a Thoreau-like figure for our time. He reminds us of the central, but often overlooked, place of nature in American life. The four films chart Coperthwaite’s life as it unfolds over the course of a year. They explore the changing character of work through the seasons and the distinctive temporality of specific tasks. Spring in Dickinson’s Reach is the longest film and the starting point of the series. It establishes, literally and metaphorically, the scope of Bill Coperthwaite’s world. In contrast, A Summer Task is tightly focused and follows a single activity in painstaking detail. Autumn’s Work records the passage of time through a change in the seasons as Bill makes preparations for winter. Winter Days draws the viewer into the quiet space and routine of the year’s end. At the heart of the series is Bill Coperthwaite himself. The films offer a biography of sorts – not in the conventional way of a recounting of a life but by asking us to attend closely to its living. Who is Bill Coperthwaite? How do we understand his life? What does it mean to dwell in nature? Mr. Coperthwaite: A Life in the Maine Woods is filmed in what is called an “observational” style. Shooting with a handheld camera, noted ethnographic filmmaker Anna Grimshaw eschews the usual documentary conventions of interview or narration. Instead she seeks to hew close to the rhythm and texture of Bill Coperthwaite’s world, utilizing a “handmade” approach that mirrors the philosophy and practice of her subject’s life in the woods. The series will provoke thought and discussion in a wide range of courses in American studies, cultural anthropology, sociology, environmental studies, and philosophy. It was produced by Anna Grimshaw, Professor in the Graduate Institute of Liberal Arts, Emory University.